This telegram led us to information on the Morris-Pembleton Family. Adelade Mary Morris married Benjamin Pembleton in 1903 in Anthony, Kansas. But between 1905 and 1908, they headed west to Seattle Washington. Surely, they traveled to Seattle for better opportunities in a “big” city, but actually Benjamin worked as a street cleaner, and later a building cleaner. His hardwork, however, paid off for his sons. This telegram announcing Addie’s death at the age of 70 was amongst her sister’s (Pearl) belongings. (As most of you, I spend much of my time in basements, attics and storage spaces.) Pearl’s descendants had oodles of family relics. 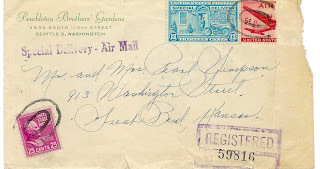 We were able to piece together the puzzle once we found letters on Pembleton Brothers Gardens' stationary from Seattle. 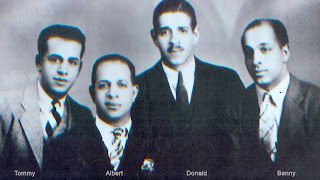 But who were the Pembleton Brothers? Our first clue was in the first few words “Dear Sister Pearl” dated December of 1946, a few months before she died. Sister Pearl probably saved the letter knowing her sister was very ill (as revealed in the letter). The next letter was sent to “Aunt Pearl” and signed by Bennie, (the same who signed the telegram) after his mother's death in December . This opened the doors to researching not only Addie’s life in Seattle, but that of her four sons: Albert, Thomas, Donald and Benjamin and what dapper looking fellows they were. We were quite impressed also with the family business, Pembleton Brother’s Gardens. They obviously were doing quite well in their business. Money was sent with both letters. The first one had $6.00 in it for Pearl and husband to buy a Christmas gift. The second letter from nephew Bennie had a check!